North Hill on Garland is a cozy, casual pub. Most wouldn't order a Hot Pocket at a bar, no matter how inebriated they are, or willing to indulge a guilty pleasure. But you will, we think, want to order a "Hot Hill Pocket" at the newly opened North Hill on Garland. The house specialty ($7), served with three fillings — bacon cheeseburger, pepperoni and the vegetarian/vegan-friendly black bean — is one of many dishes that North Hill co-owner Matthew Stanton describes as "elevated American bar food." "People have nachos on their menu and you can get those anywhere, and it's nothing standout and chef-driven, so we thought, let's do it our way, let's make it with quality ingredients and try and source local... and do stuff a little bit better than anyone else, or at least what we think is," Stanton explains. North Hill on Garland opened in November after construction delays pushed out a targeted September opening. 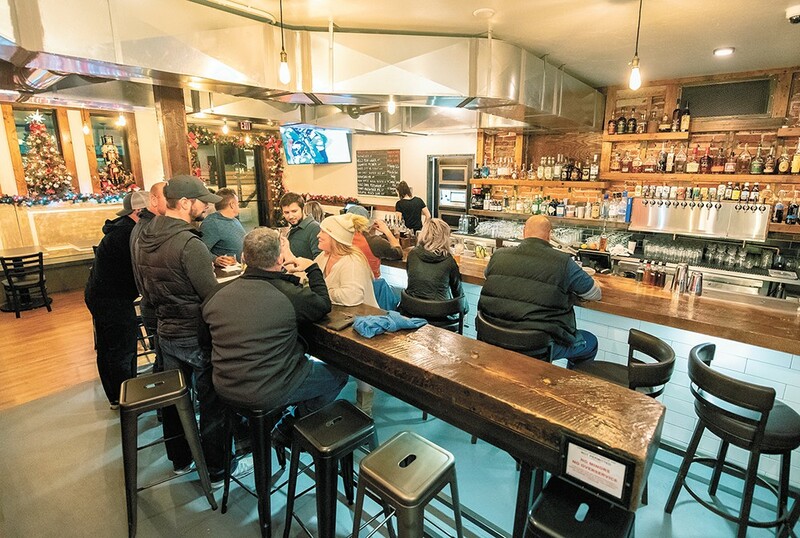 Located inside and named after the former North Hill Masonic Lodge, the restaurant and bar is co-owned by Stanton and business partners Paul Cassel, Keith Riddle and Darin Talotti. Riddle and Cassel own the building and real estate group Synergy Properties, located on the floor above. Talotti co-owns Red Lion Barbecue and Whisk bar in downtown Spokane, and formerly was a partner in the Viking. Stanton, meanwhile, is a Spokane native who now splits his time between this venture and his San Diego bar, the El Dorado Cocktail Lounge. North Hill is not large, with capacity inside for about 50 guests, including some family seating. When warm weather returns, however, two outdoor patios, one on street level and one above on the second floor, overlooking Garland Avenue will more than double North Hill's capacity. When designing the menu, Stanton and the team took into consideration the restaurant's small kitchen, which doesn't allow them to grill burgers, hence the cheeseburger-inspired "Hill Pocket." Filling out the rest of the menu is pizza — thick-crusted Detroit or deep-dish Chicago style are offered as options for each house pie — and flatbreads. Pizza ($14-$16) combos include spicy Hawaiian, all meat, margherita and Italian. For smaller-portioned flatbreads, North Hill serves a tri-tip ($12), caprese ($11) and the herbivore ($11), an all-veggie combo. Sandwiches are another North Hill specialty. The tri-tip dip ($12) with caramelized onions, Swiss cheese, horseradish cream and a side of au jus, is an early customer favorite. The appetizer list gives a nod to the spot's creative bar food approach, with pigs in a blanket ($10) filled with Italian sausage, cream cheese and wrapped in pretzel dough. There's also tri-tip and chicken nachos ($13), wings ($8) and barbecue-sauce marinated pork shanks ($12). Kids get their own options ($5-$7) of mac 'n' cheese, chicken nuggets and single-serve pizza. Soups, salads and a handful of desserts round out the menu. "The sandwiches and salads go above being deep-fried bar food," Stanton says. "The idea was to keep it simple and approachable and affordable. Same with drinks." In the bar, North Hill's team has developed a collection of signature craft cocktails ($7-$9) featuring fresh-pressed juices, infused spirits and house-made syrups and bitters. The list features classics like the old fashioned and a couple classics with a twist, like the Pimm's Cup, featuring cucumber-infused vodka with fresh lemon and ginger. Rotating craft beer on tap and a few house wines complete the drink menu. The original print version of this article was headlined "Pub on the Hill"